K-pop boy band BTS got all soaked on the latest episode of its web variety show “Run BTS!” that aired Tuesday on V Live. In the second and last part of the Korean spa episode, the seven bandmates continued a quiz on internet acronyms inside the sauna. The clueless Jimin and J-Hope had the most trouble guessing at the abbreviations. Meanwhile the rest of the band ate watermelons outside, chatting about how bad the two were at keeping up with the rest of civilization. “Look at his face,” said RM as Jimin finally came out of the sauna sweating. His bandmates offered him watermelon. “Eat this one. It’s cold,” Jin said. The next and final round of the game involved rock-paper-scissors and a lot of water splashing and underwater breath-holding. In the end, all of them got wet. 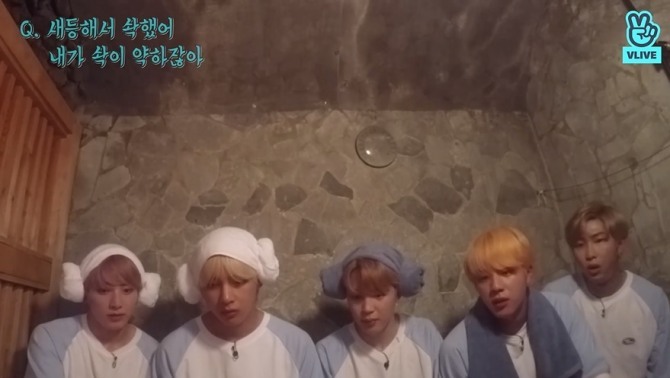 Watch the 62nd episode of “Run BTS!” at https://www.vlive.tv/video/105504. 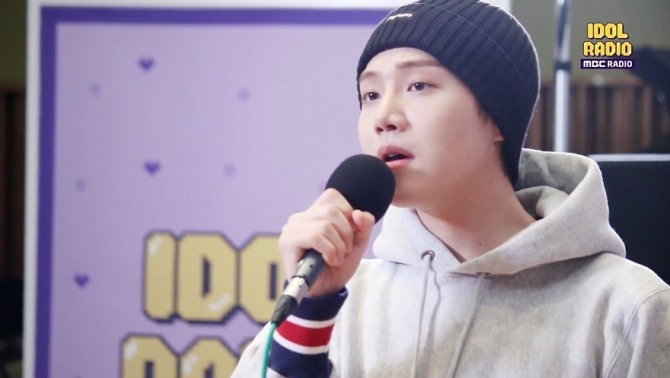 “Idol Radio” on Tuesday released a behind-the-scenes video clip of Pentagon’s Jinho singing a Korean ballad from the early 2000s. Jinho, the main vocalist of the nine-member K-pop act, appeared on MBC’s radio program which is focused on K-pop groups and hosted by BTOB’s Jung Il-hoon. Jinho, who had his second solo concert in Seoul last month, performed “Doll,” a 2001 duet originally by Lee Ji-hoon and Shin Hye-sung, on the 126th episode of the show Tuesday. Listen to Jinho’s cover of “Doll” at https://www.vlive.tv/video/112100. Oh My Girl bandmate Seunghee’s solo broadcast was the V Live editors’ pick for Tuesday. The 23-year-old K-pop singer livestreamed for about an hour from a hotel room in San Paulo, Brazil, on Monday, Lunar New Year’s Eve. The editors’ pick clip, about four minutes long, captures her cute reactions to fans’ comments. The seven-piece girl group was visiting the country for official fan events. 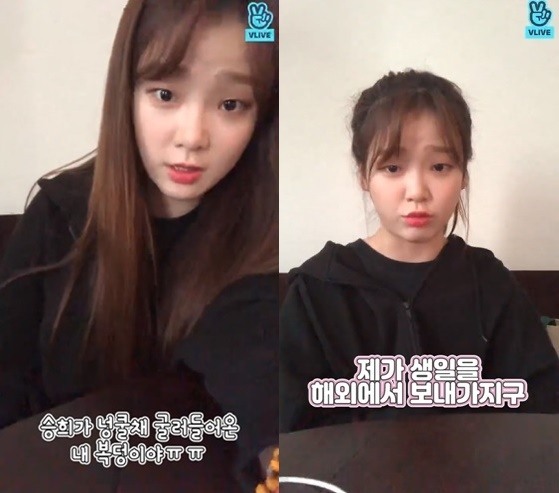 Watch Seunghee’s broadcast at https://www.vlive.tv/video/112022?channelCode=F51143.